Green Day promise a sweaty show at the Garden tonight. BEING GREEN: Riding the massive critical acclaim prompted by ther spring album release ‘21st Century Breakdown,’ Green Day is playing their first set of live shows in three years. 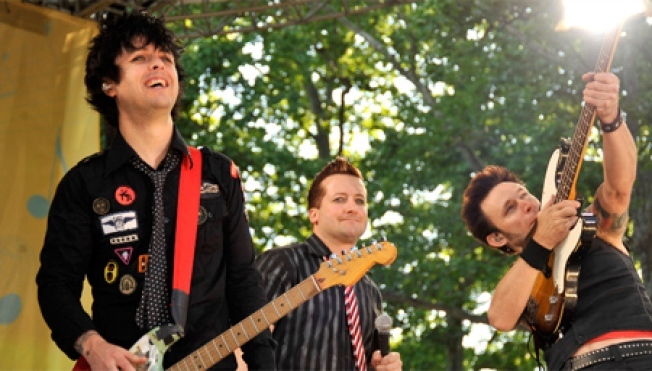 Catch Billie Joe Armstrong, Mike Dirnt, and Tré Cool at the first of two Madison Square Garden shows tonight at 8PM, with the crowdpleasing Kaiser Chiefs opening. SPACED: Part of the 2009 River To River Festival, ‘A Space Funk Invasion’ pairs Nicholas Leichter Dance and Monstah Black with music from Daft Punk and the Time. Result: A clever performance with way more swagger than your garden-variety modern dance piece. South Street Seaport, 6PM. CLASSIC: Long before TMZ ran its first sketchy headline, 1957’s ‘The Sweet Smell of Success’ was a musing on the sleazy quidproquo of the big-city media spin machine. Tony Curtis and Burt Lancaster wear sharp suits and spit some of moviedom’s greatest dialogue (by Clifford Odets and Ernest Lehman) in the iconic NYC noir, screening on the Elevated Acre (55 Water Street) at 8PM.